Featuring Dorothy Loudon, Jerry Orbach, Roddy McDowall, Nancy Walker, Blosson Dearie and more. 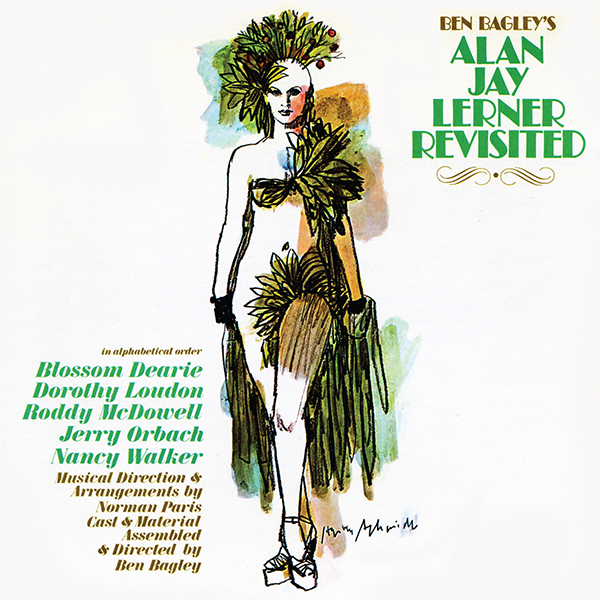 It’s high time to revisit the Ben Bagley’s Revisited series, beginning with this wonderful example – Alan Jay Lerner Revisited. Bagley’s revues were kicky fun and these albums were a natural offshoot of them. He always assembled an interesting group of singers for his albums and had a variety of different musical directors/arrangers over the years. This is the first of several reissues of his classic albums, with many more to come. The Bagley CDs were not especially well mastered so we have done a lot of work to spruce them up with our wonderful mastering engineer, James Nelson, doing his customary great work. They sound better than they ever have before. And of course it’s wonderful to have all those incredible Harvey Schmidt covers. There are all new liner notes and lovely packaging. All these CDs are long out of print – recently there have been a couple of CD-R issues of a few (none that we’re doing), but those have no remastering or packaging. Most of the out of print titles, including this one, go for big money, so it’s great to make these available at our regular price. ALAN JAY LERNER REVISITED is limited to 500 copies only and priced at $19.98, plus shipping. CDs will ship by the last week of June, but never fear, we’ve actually been averaging three to five weeks early in terms of shipping ahead of the official ship date. ATTENTION INDIEGOGO CONTRIBUTORS: IF YOU WISH TO RECEIVE THIS RELEASE YOU MUST OPT-IN BY SENDING US AN E-MAIL AND SPECIFY WHICH ALBUM YOU WANT – SEND TO kritzerland@gmail.com. IF YOU DO NOT WISH TO RECEIVE IT, YOU DON”T NEED TO DO ANYTHING. IF YOU ARE NOT AN INDIEGOGO CONTRIBUTOR, ORDER AS YOU NORMALLY WOULD. THANK YOU.